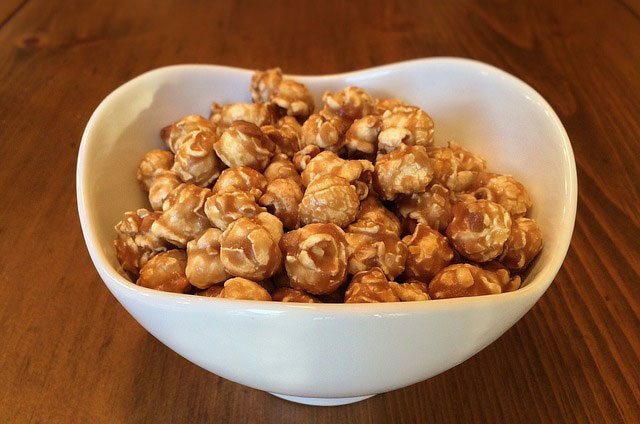 Sweet and Salty sums up this festive holiday recipe treat of Caramel Apple Popcorn. Get in the holiday spirit with this halloween recipe. Spread popcorn and peanuts on parchment paper-lined cookie sheet. In disposable decorating bag, melt candy in microwave at 50 percent power for 1 minute; remove bag and knead. Continue melting candy for 30-second intervals at 50 percent power until completely melted. Snip off end of bag and drizzle melted candy over popcorn. Let stand until candy has hardened, about 20 minutes.